Fall is the perfect time to get outdoors and start enjoying some time with your family. The weather is cooler, the air crisp, and autumn colors surround you in hues of red, orange, and gold. Nature seems to put on one last show for the season, and so it is the perfect time to discover what frugal fall family activities are waiting for you. You don’t need to spend a lot of money or even a lot of time in order to enjoy some fall family activities. You just need to get a little creative and take advantage of all of the supplies that nature provides for you. Take a look below at 10 frugal fall family activities you can enjoy this season with the ones you love. Gather trash bags or old clothing pieces and stuff them either with newspaper or the many leaves that are now scattered all over the yard. Fluff and stuff until you have a body shape. Adorn your scarecrow with old hat, gloves, or other thrift store accessories. Place your whimsical creation in your yard or on your front porch to greet guests. Oh, and don’t forget to name him! Fall tends to be a great time for certain produce varieties including apples and squash. Visit a local farm where your family can pick these items together. Gather the produce and take it home where you can research some fun recipes to try! After decorating your Halloween pumpkins, take the seeds you gathered and clean them off under hot water. Pat dry with a paper towel and then lay the seeds out in a single layer on a cookie sheet. Sprinkle the seeds with salt and pepper and bake at 350 degrees until golden brown. Now enjoy this tasty snack together! 4. Read some fun fall books. Visit your local library for a variety of fall themed books you can enjoy as a family. Red Leaf, Yellow Leaf and Leaf Man by Lois Ehlert are two great choices to get you started! Head to your local library and see what titles await you. 5. Enjoy a hay ride. Check with local farms to see if any of them offer weekend hay rides. This is a great way to enjoy the fun and frugal farm life while getting some fresh air in a pile full of hay! 6. Sip on warm cider. You don’t need to whip up anything fancy, just buy a gallon of apple cider at your local market. Pour it in a pot and heat over the stove until warm. You can even toss in some cinnamon, nutmeg, and orange slices if you wish. Serve warm with donuts or pie for a special treat. 7. Do some leaf rubbings. Now is the time of year where leaves are falling all around you. Grab a few neat leaves and place them under a piece of paper. Take a crayon, remove the crayon wrapping, and gently press and shade over the piece of paper revealing a rubbing of the leaf beneath it. 8. Head to your local park. A local state park is a great place to watch nature unfold. Head to your local park with binoculars in tow and check out the changing leaves, birds in flight, and animals preparing for winter. It will be a busy time in nature, so go and observe it! Bulbs are best when planted during the fall months. Grab a package of bulbs and plant them in your yard as a family. Come spring, you will be able to watch all of your hard work bloom! 10. Have a pumpkin carving contest. Head to your local market and grab a pumpkin for each family member. Set the timer for one hour and allow each member to create the pumpkin of their choice. Have a friendly competition over who can decorate the best pumpkin. 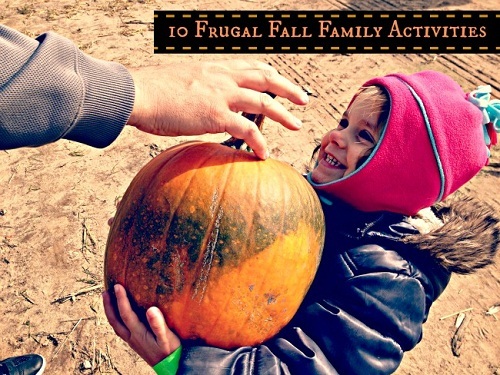 As you can see there are plenty of frugal activities your family can enjoy this fall season! Give one or even all of these ideas a try and see how much frugal fun you can enjoy together. You won’t be disappointed and neither will your budget. Happy fall!